Pixar films are incredibly popular among families, children and adults alike, which is why the films have an ever-growing presence at Disney Parks around the world. Disney California Adventure has added several big Pixar rides over the last few years, culminating in the grand opening of Cars Land this past June. 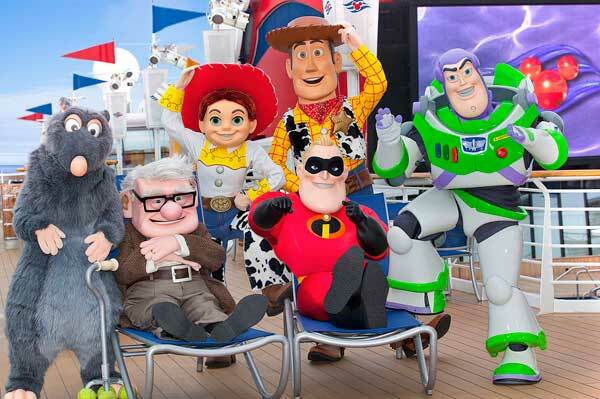 Now, Disney Cruise Line is about to be taken over by Pixar, as there are several Pixar-themed cruises set to sail starting this September. Find all the details after the break! There are a number of reasons why these cruises will be exciting for fans of Pixar films. “Artists and filmmakers” from Pixar will be on board to give presentations that take passengers behind-the-scenes of the films, including the recently released Brave. Additionally, there will be a “sneak peek at Monsters University (2013) – if brand new footage and artwork is shown, you can go ahead and call guests aboard extremely lucky. The next Pixar short, rumored to be centered around a rainy city, may even make an appearance (pure speculation on my part). Also on the Disney Wonder cruise ship will be an art exhibit, featuring a wide variety of Pixar concept art, paintings, sketches, storyboards, and more – the concept is similar to the 25 Years of Pixar exhibition, which has been traveling around the world. As an art lover, getting an up-close look at gorgeous pieces of artwork that Pixar artists drew up while working on the films sounds nothing short of amazing. It gives the public a chance to jump inside the heads of the employees who dreamt up the ideas on the way to creating classic films. Further, all of Pixar’s feature films (including the upcoming Finding Nemo 3D) will be playing on the 7-night cruise, providing passengers with a chance to experience the great films in a theater on the big screen once again. While not all of the studio’s shorts will be represented, there will be a “selection” playing. Rare Opportunity: Pixar Fun at Sea! For a limited time, Disney Cruise Line and Pixar Animation Studios have teamed up to create one of the most magical cruise experiences ever with 4 unique California Coast voyages, departing September 16, 23 and 30, 2012 and October 7, 2012. Enjoy a great rate on this once-in-a-lifetime opportunity as you go behind-the-scenes of upcoming films with Pixar filmmakers—and reconnect with some popular characters and films in an incredible, immersive way. Plus, be sure to watch the onboard performance of Toy Story—The Musical…as well as other onboard favorites that will get a Pixar makeover. These exciting offerings are only available on these 4 California Coast sailings. For more information about all the Pixar-inspired fun that awaits, be sure to check your Personal Navigator once aboard the ship. This cruise experience is the first of its kind, so book early to secure your spot. Book online, call (888) 272-8302 or your Travel Agent to make reservations today.